Fly again in the dream land to fight the enemies that caused the terrifying dreams in Kirby: Nightmare in Dreamland. Find out the problems to restore peaceful sleep! Kirby: Nightmare in Dreamland is an action platforming video game released for Game Boy Advance (GBA) and a remake of the 1993 Nintendo Entertainment System (NES) video game, Kirby’s Adventure. 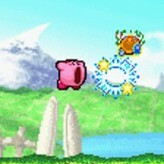 In this game, you will control Kirby, a creature that inhales its enemies to copy their abilities or spit them out to shoot energy balls. You can fly and maneuver by inhaling air. Use the abilities of the enemies like explosion, electricity, fire and many more by absorbing enemies. Find the missing fragments to restore order in the land of dreams and defeat the nightmare before it’s too late! Kirby: Nightmare in Dreamland is an online GBA game that you can play at Emulator Online. This free Game Boy Advance game is the United States of America region version for the USA. Kirby: Nightmare in Dreamland is a single title from the many adventure games, action games and kirby games offered for this console. If you enjoyed playing this, then you can find similar games in the gba games category. Kirby: Nightmare in Dreamland game is from the various retro games on the site, and there are more games like this, including Kirby: Canvas Curse, A Nightmare on Elm Street and The Legend of Zelda: Ocarina of Time.